The Woollies staffer looked really confused. “You know, tapioca?” I tried again. He looked at me blankly. “Well, where are puddings then?” Third time lucky. Down on the bottom shelf, hidden away among jellies and instant puddings, was one solitary brand of sago. Sago was once upon a time a nursery dessert staple. IIn Taiwan, they use larger tapioca balls to make the chewy ‘pearls’ in peal milk tea. Sago is quite common in Asia and easy to find in most Asian grocery stores (but alas they had sold out at my local one). I also like the Malaysian version of sago pudding – sago gula melaka – made with coconut milk and served with a palm sugar syrup. But wait, didn’t I say plum pudding? You know the traditional English featuring dried fruits, made with or without suet? Made months in advance, and hung from the ceiling to age only to be boiled for hours on Christmas day? It always kind of annoyed me that, at the height of summer, when Australian stone fruit including plums are at their best, that Australians sit down at Chrissy lunch to hoof down huge servings of super rich dried fruit drowned in brandy custard and brandy butter. Why don’t we eat fresh fruit? I am sorry if I am upsetting traditionalists. I have eaten my fair share of plum pudding as well, and will doubtless do it again come 25 December this year at our family gathering. 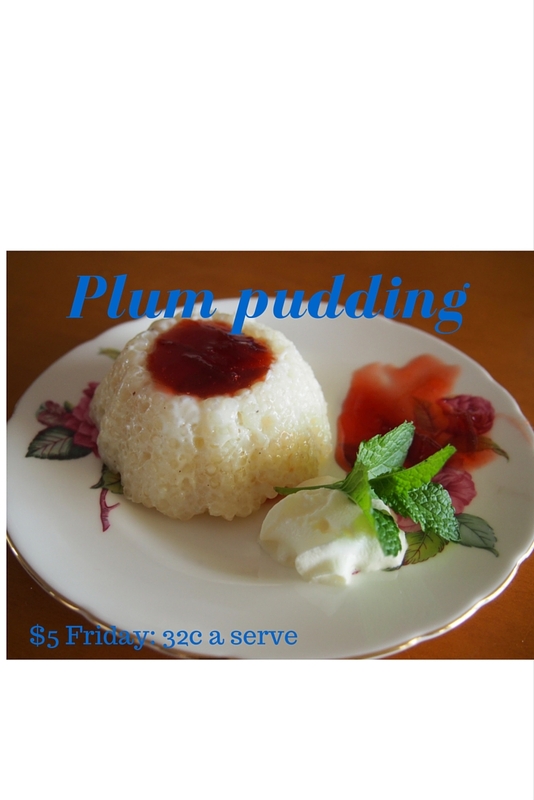 I even went to great lengths to have a plum pud sent over to me when I lived in Taiwan. Who can resist eating a solid plum pudding? Isn’t it part of tradition? I have fond memories of finding coins in my Christmas day plum pudding as a child, with my Nana (who baked them in) hovering and worrying about me potentially choking on them. It was a bit of a competition to see who could get the most coins – Nana would pacify potential arguments by giving those who missed out extra. But my point is that it is such a shame not to enjoy locally grown fruit, seasonally at its best, on Christmas day. Can’t we create new, antipodean traditions that incorporate seasonal produce? I served this simple pudding two ways: plain with plum jam and ripe plums on the side; and layered like a parfait. I liked them both, but as it was quite sweet I would recommend also serving with quality vanilla ice-cream on the side or layering with lightly sweetened cream on top of the jam and again on top of the pudding. And while more expensive, you could also make it a bit like a pavlova, creating one large decorative mould and topping with cream, passion fruit, banana, mango and other tropical fruits. Soak the sago in the milk for one hour – preferably longer. Cook the sago in the milk over a low heat, stirring constantly, for around 15 minutes until the sago is translucent. I am always impatient cooking sago, and I have found the longer I soak in the milk the easier it is. Grate in some nutmeg, and add the sugar. Stir until the sugar has dissolved. While still warm, spoon into parfait glasses or moulds. If using moulds, rinse with water first and ensure the moulds are slightly wet before spooning in the mixture. (Frugal note: small yoghurt tubs make good moulds). If doing parfait style, spoon in a little of the mixture, allow to cool slightly. Meanwhile, dissolve the gelatine in boiling water, add to the plum jam then allow to cool slightly until ti starts to gel. Spoon over the sago mixture, then reheat the sago slightly to soften and spoon more on top.